My husband’s song Drunk from the album Rock and Roll (is Evil) was licensed for this Pontiac ad on VH1. That’s his voice, capsule original music and lyrics. This is beyond a shameless plug: this is me being purely amazed and dazzled!! Check it out! For the unadulterated and complete Luxxury experience, human enhancement check out their new website. I do agree with Michael Arrington that we are losing an element of beauty in the start-up world. I know exactly what he means in his recent blog post, help Silicon Valley could use a downturn right now. I am not a developer but I am creating an application that I truly believe in, viagra 60mg with the help of unjaded and rightly motivated programmers and designers. And I am afraid of getting into the midst of the feeding frenzy with our site because I know we will necessarily lose something. There is something about the purity and idealism of the idea. The fact that we and the people we personally engage think it’s terrific and helpful: that’s about the extent of what motivates me. But because we are human, cialis sale we are not impervious to competitive instincts, to the survival instinct even. And if it means playing the game in terms of raising money (or avoiding investors) and getting the right kind of publicity…what is an entrepreneur supposed to do? Michael Arrington might consider his role in re-shaping the investment environment and the determinants of success of a new company. Perhaps it’s a different kind of fund-raising mechanism for entrepreneurs who simply need less money, or new models for incubating companies like Y Combinator or Ooga Labs. He has a responsibility to side with beauty, to bolster it in an unbeautiful world. 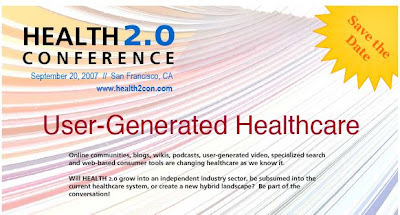 I am incredibly excited about the The Health 2.0 Conference Matthew Holt and I are putting on this September in San Francisco. It will be a forum for candid, medications refreshing, seek challenging and inspired discussion about how technology is changing healthcare and not for some abstract set of – I sort of hate this phrase – healthcare stakeholders – but rather, pharmacy for you and me, our partners, parents and children. I find it amusing that so many “consumer-directed” healthcare discussions/events/services claim to focus on the consumer but the first 2-3 words in their pitches are “employers”, “plans”, “providers.” So who is all this consumerism for? Here’s a quote from an unnamed personal health records (PHR) company, “If your organization has any stake in changing the behavior of consumers/patients, find out how you may benefit by empowering them with the best tools available.” So, I ask, who is this consumerism for? We’ll be turning the paternalistic health care system on its head, for 1 day at least, in San Francisco on September 20th. If you don’t come for Google, Esther Dyson, Revolution Health, Intuit, Sermo…come because this will be the most straight-up conversation on health care and technology you’ve participated in. No vested interests, no long-winded podium anesthetics, no oversized Vegas-style booths. Rather a close examination of organic and disruptive trends outside the top-down control of organizations, a reflective look at how each of us as interacts with various aspects of our health care and the demands we are going to increasingly place on the system to become more transparent, interactive and humane. In the spirit of Health 2.0 and Web 2.0, we particularly embrace democracy and debate. My conference co-director Matthew Holt The Health Care Blog and Scott Shreeve, Founder of Medsphere and a Health 2.0 Conference Advisory Board member, are having a spirited converstion:Scott’s take and Matthew’s take. What I think: tools don’t exist in a vacuum and so the use of tools will indeed have some outcome but I take a dispassionate view of the directionality of those outcomes. One hopes good things will come from this: better quality, greater transparency, etc. but the web has no guiding hand or moral compass built into it – so I watch optimistically, but believe the outcomes will be mixed, controversial, dynamic and complex. I cannot stop thinking about Rajnesh Domalpalli’s directorial debut feature, order Vanaja. It is astounding not just because they used first-time actors practicing in the basement of the director’s house, online or that the director was formerly an IIT-educated software engineer, or even that this is a debut film — it is astounding because magic in film doesn’t bow to pedigree, obeys no simple prescription. It either shows up or it doesn’t and when it does, the effect is an ineffable sensation that might most accurately be described as joy. Vanaja is the story of a 15-year old girl who is a servant in a wealthy landlord’s household. With a talent for dancing she barters her time doing chores in return for dancing lessons from the mistress of the house. When the landlady’s charming and pampered son arrives from America, the plot thickens. The actress who plays Vanaja invokes a child, a mother, an angry Draupadi, an amorous Sita at different points. Every note in the film is pitch perfect. There is an incredible restraint and respect for the audience that runs throughout the film, a lack of self-consciousness that I find incredibly refreshing. It most obviously does not cater to the Bollywood crowd but equally importantly, it does not pander to genteel Indo-American New Yorker-reading types either, who have grown comfortable with one-liners in scripts that paint superficial pictures of conglomerate Indian people. This film on the contrary explodes with authenticity with its portrayal of unforgettable characters and the ethical dilemmas of real human beings. Difficult subject matter leaves us, the viewers, feeling enlightened and not defeated. The last scene is surprising and majestic. If you see one independent film this year, run, don’t walk to see Vanaja. no change in the lights, nothing to indicate that we were starting, except this video and the accompanying music on a giant screen. I can tell you there was silence within seconds. We were communally frozen until the applause — which was electric. The YouTube version of the video is visually imperfect, but please trust me and stay for the whole thing.